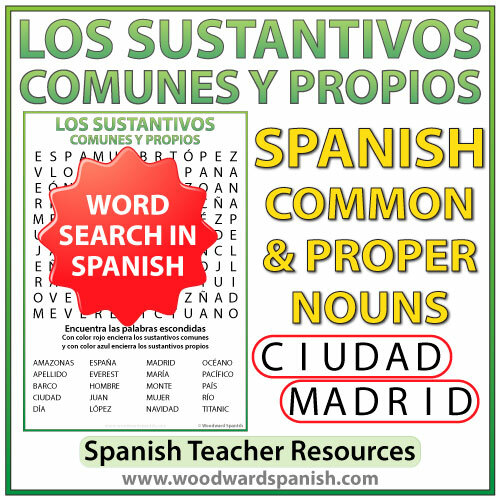 Spanish Common Nouns and Proper Nouns Word Search. Sopa de Letras de los sustantivos comunes y propios en español. Word Search with Vocabulary about the Common Nouns and Proper Nouns in Spanish. This activity contains the following 20 words: Amazonas, Apellido, Barco, Ciudad, Día, España, Everest, Hombre, Juan, López, Madrid, María, Monte, Mujer, Navidad, Océano, Pacífico, País, Río, Titanic. You will notice how there is a common noun (such as País) with its corresponding proper noun (such as España). One worksheet is without clues. There are lines (spaces) where students have to write the Spanish Common Nouns and Proper Nouns that they have found. This worksheet is good for students that have already seen this topic or are normally fast finishers. 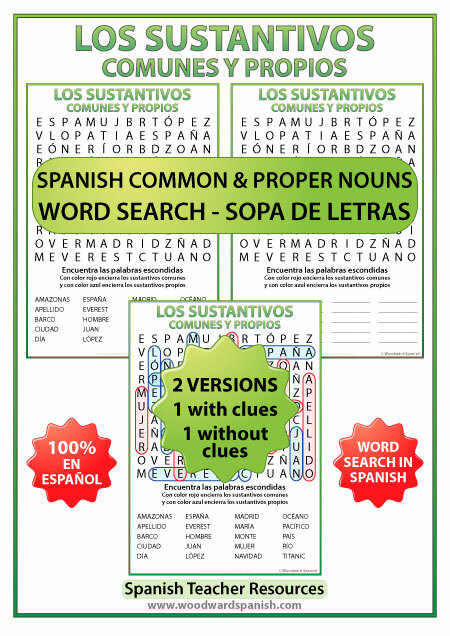 This Word Search is completely in Spanish without any English on the worksheet and is ideal for Spanish 1 level students and for those in Grade 2 in Spanish-speaking countries. Sopa de Letras con diez sustantivos comunes y diez sustantivos propios en español. Contiene 20 palabras: Amazonas, Apellido, Barco, Ciudad, Día, España, Everest, Hombre, Juan, López, Madrid, María, Monte, Mujer, Navidad, Océano, Pacífico, País, Río, Titanic. Esta actividad es ideal para alumnos de 2º Básico.